Robert Heidbreder. Illustrated by Rae Maté. Croc-ready for their first touch down. Those crazy crocodiles readers met in Crocodiles Say.... are back at it again. They're all dressed up to play what should be hockey, football, golf, basketball and other popular sports, but they have their games all mixed up. Baseball morphs into basketball and golf into baseball, and on it goes. 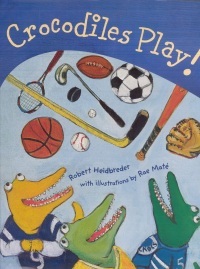 Early years students will enjoy the Crocs' absurd antics and will take pleasure in taking the book off the library shelf. 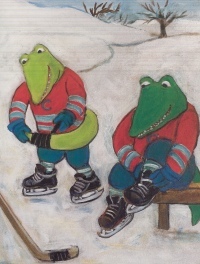 The well thought out poems include essential vocabulary for each sport being played, which adds to the value of the book (even if the Crocs get the game wrong). Golf-- green, rough, clubs, course, tees; tennis- rackets, pro, court; football--helmets, pads, touchdown, whistle; baseball--caps, shoes, mitts, bat. The colorful, cartoon-like, full-page illustrations of the toothy reptilians add immensely to the overall fun of the book. Ian Stewart is a early-years support teacher at David Livingstone School in Winnipeg, MB.